Protecting occupants in a school and providing a safe learning environment is important. When economic times challenge school leaders, there are possible safety strategies to employ on a no to low cost budget. This lesson discusses school safety strategies related to access control and communication. Understand a wide variety of risks to school facility assets. Undertake a collaborative approach to school security. Understand risks related to access control and communications. 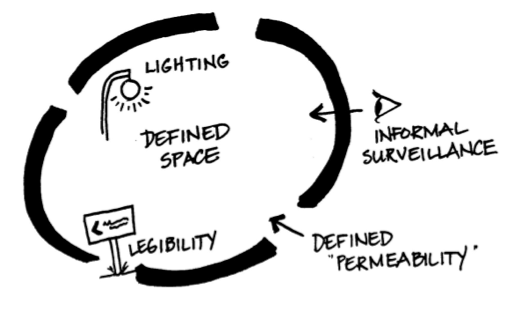 Understand basic Crime Prevention Through Environmental Design (CPTED) principles. Idenfity helpful, related school security resources. Why Should You Secure School Facilities? Security is the protection of assets. Assets are like nouns: people, places, and things. In schools, people are the most important asset. Protection measures that protect people the most, such as access control and communications should recieve priority. Schools are faced with the daunting challenge of protecting students, staff, and visitors under increasingly difficult circumstances. School facilities should recieve first priority because they have maximum concentration of your most important asset - people. Security assessments assist schools in determining the appropriate combination of practices, systems, programs, instruction and preparedness to protect assets. This lesson will introduce an approach for school safety to protect school assets that is both collaborative and comprehensive. Particular emphasis will be placed on improving access control and communications. An attempt has been made to provide strategies that can be implemented at little or no cost. Helpful resources can be found at the conclusion of the lesson. A comprehensive approach to security assessments is appropriate when planning to protect assets. The variety of assessments will help planning teams identfiy and assess risks, threats, and hazards, as well as helpful resouces to use when planning to protect assets (U.S. Department of Education, 2013). 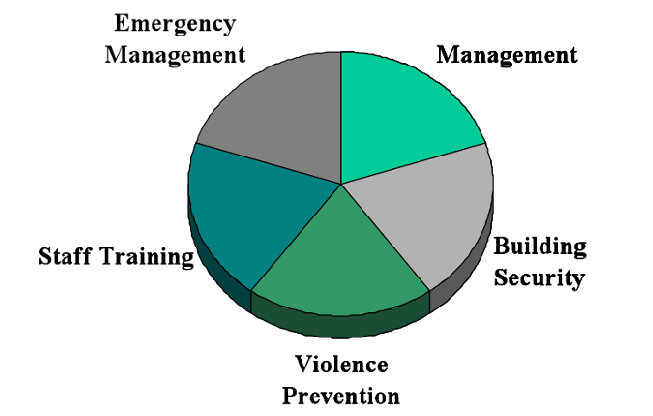 The diagram above illustrates the components involved in a comprehensive physical security assessment. The following list will explain in greater detail the factors of each security assessment. Documented security practices and policies serve as the foundation for a safe learning environment. From visitor management practices, to expectations for monitoring exterior activities, ensure that practices and policies have been documented and disseminated to the appropriate stakeholders. Assess existing systems and products within the school building and prioritize measures that will enhance protection effectiveness. This area addresses prevention and intervention programs, including bullying, substance abuse, and dating violence. People determine the effectiveness of many security systems. For example, a propped door can render electronic access control ineffective. Foster a culture of security awareness and provide routine instruction for teachers and staff. Prepare for emergencies by coordinating with local responders, developing plans, acquiring supplies, and conducting drills. 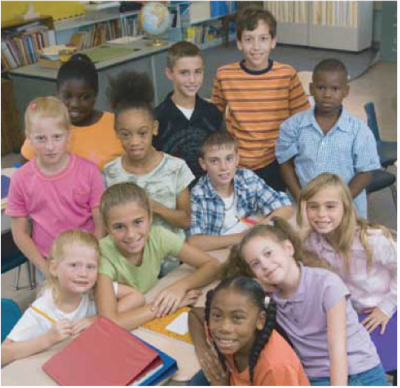 The following page will introduce a collaborative approach to providing a safe learning environment. A collaborative approach involves information-sharing and decision-making contributions from internal and external stakeholders. An effective security program requires a collaborative approach. The chart above illustrates an ideal collaborative planning team. The chart provides a few examples of potential team members but does not provide an exhaustive list of team members. Various stakeholders are essential to a collaborative planning team for perspective and accountability reasons (U.S. Department of Education, 2013). The four boxes on the inside are internal stakeholders and the four boxes on the outside are external stakeholders. In terms of internal stakeholders, students are probably the most excluded and vital stakeholder group. Student contribution is vital because they are ahead of adults in terms of technology and have a better idea of issues occurring with other students. Collaborative planning teams can direct focus on access control, both into a school and onto school grounds. Management, building security, and staff training are especially important areas in ensuring a school has effective access control. The following page will discuss components of effective access control. Effective access control involves a variety of different components. The following list describes practices and systems that may contribute to a safer learning environment. Exterior doors and gates should be closed and secured, unless monitored. Visitor permission to enter is granted remotely using technology. This kind of system offers improved control and alleviates some key control issues. A locked, or secured, main entry vestibule may help keep visitors from accessing the facility until authorized by designated personnel. Credential exchange, or a visitor management software system, is practiced. In a credential exchange practice, a visitor provides a photo ID before receiving a badge that hangs on a colored, break-away lanyard. A second exchange is made at the conclusion of the visit. IDs on colored, break-away lanyards for staff are required. All staff wear one color, all visitors wear a very different color. Lanyards are recommended because stickers may cause damage and may not adhere to many types of fabrics. Vacant interior rooms remain secured to prevent theft and unmonitored activities. Continue to the next page to view more illustrations of ineffective access control. The scene of the outdoor play area below demonstrates several vulnerabilities. 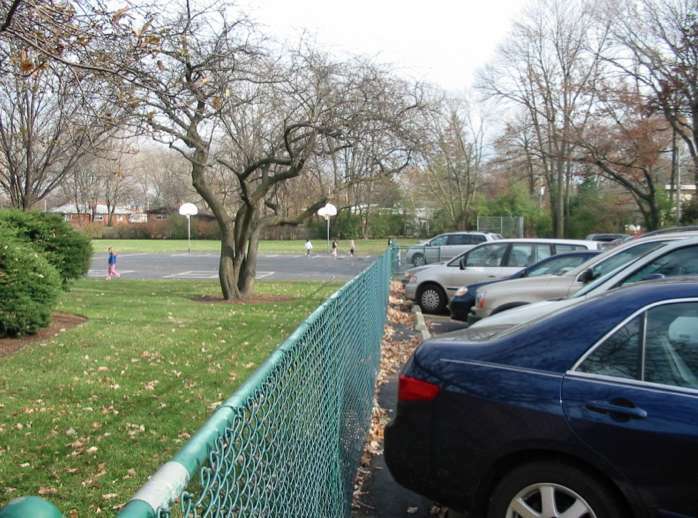 Designated staff members should secure the playground area before students are granted access. Visible monitors on the playground should be marked (i.e. orange safety vest) and form a perimeter around the students. A sample recess diagram below illustrates an effective method for access control. Marked staff (to present a presence of security) forms a perimeter around the students (to provide a safety barrier). Each staff member should be equipped with a two-way radio (for immediate, emergency communication), First Aid supplies (to immediately assist students and protect staff that administer care), and a whistle (to get students attention). The next page illustrates access control related to exterior and interior doors. Ensure interior gates comply with safety codes. Monitor entry ways for door propping devices. Secure all vacant rooms to prevent theft and unmonitored activites. Train staff to complete security assessments. The following pictures depict access control issues related to a building's physical security. Existing piping, in the photo on the left, was frequently used to provide easy roof access. Unauthorized roof access is now prevented, in the photo on the right, by the installation of sheet metal that is bolted tight to the building. The facility on the left is attempting to prevent vehicle access to the main entry area with the use of barriers (cement planters). The facility on the right did not have vehicle barriers. The car was only stopped from accessing the foyer by door stops. Bollards installed outside the main entry may have prevented vehicle access. Items of value in vehicles should not be visible. 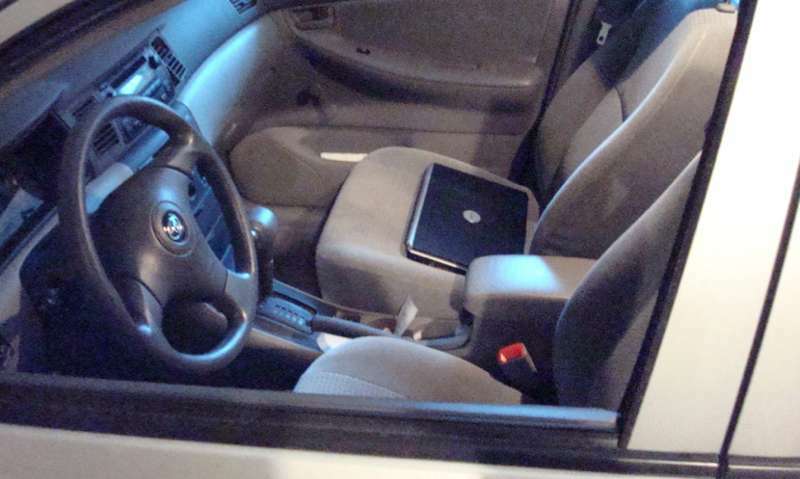 Discourage parking lot theft and vandalism by instructing staff to store valuable items out of plain view. The subsequent pages will focus on how to effectively communication to handle situations that risk the safety of assets. Effective communication involves a variety of different components. Reaching someone, when a staff member needs assistance, is vitally important. It is equally important that emergency announcements reach all areas where staff members might be. The following list describes practices and systems that can contribute to a safer learning environment. All telephones should be labeled with emergency dialing instructions, such as how to dial 911 (i.e. 9-911) and the Main Office (i.e. XXXX). 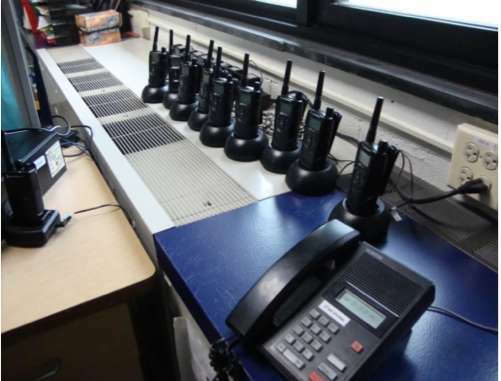 Ensure that Public Address (PA) systems have comprehensive coverage on the interior and the exterior of the facility. Ensure intercom systems are functional. Require administrators, facility's personnel, and staff monitoring student movement to carry two-way radios at all times. Cellular phones should not be counted on as the primary means of emergency communication. Cell phones can be unreliable, can have signal strength issues, and frequently face low battery problems. Encourage staff to store In Case of Emergency (ICE) information in cellular phones. Complete the activity below to see illustrations of communication practices. The subsequent pages will focus on the principles of Crime Prevention Through Environmental Design (CPTED). 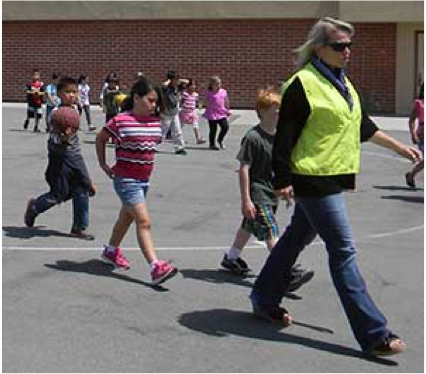 Schools may use Crime Prevention through Environmental Design (CPTED) to improve security. Common security issues, especially related to access control, may be prevented using CPTED principles. Natural Surveillance - providing bright exterior lighting and trimmed foliage at entrances, in parking areas, and along walkways. Designed Access Control - facility measures and features that direct visitors in and through predetermined areas. Border Definition - fencing and landscaping that designate property lines and boundaries. Maintenance - order and cleanliness that demonstrates care and pride. The next section will focus on emergency preparedness. All school stakeholders should know how to respond in an emergency situation. Physical security measures alone cannot prevent acts of violence. The measures we have discussed to this point most effectively reduce risk when combined with a heightened sense of awareness and healthy relationships between staff and students. Pursue a comprehensive and collaborative approach to school security with physical security measures and emergency procedures. 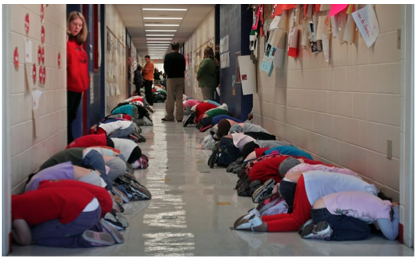 In most school shootings, there was "prior knowledge" in advance of the incident. Healthy relationships and a positive school culture may reduce the risk of a school shooting. According to statistics from the U.S. Secret Service & the United States Department of Education, at least one other person had some prior knowledge of an attacker's plan in 81% of incidents (Pollack, Modzeleski, & Rooney, 2008). In 59% of incidents, more than one other person had some prior knowledge. Of those incidents where another person knew about the attack in advance, 93% of those people were the attacker's friend, schoolmate or sibling (Pollack, Modzeleski, & Rooney, 2008). 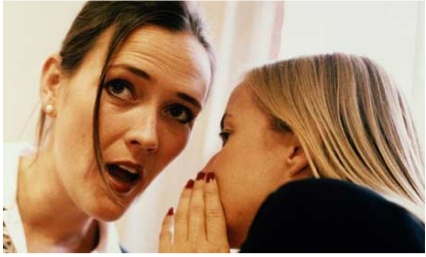 The trust built between staff and students within a healthy relationship may help prevent a school shooting because a person with knowledge of a planned attack may confide in another person who can alert authorities. Schools are required to have written emergency plans. Effective emergency management also involves a variety of additional components. The following list describes tools and supplies that can contribute to a state of readiness. Bomb threat checklists should be kept within arms reach of main telephones. United States Postal Service (USPS) "Suspicious Mail of Packages" posters should be displayed in areas where mail is sorted. Emergency flipcharts provide staff members with a concise version of basic emergency procedures. 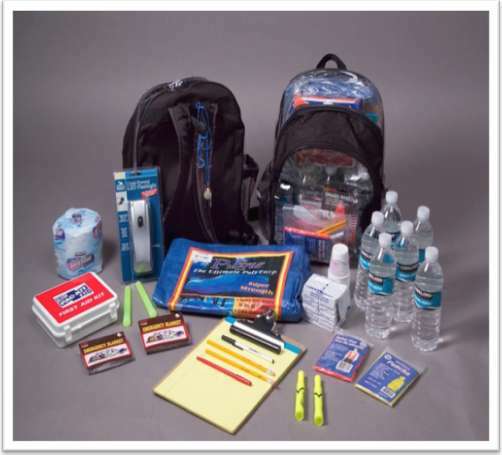 Schools should store emergency supplies, such as flashlights, mylar blankets, and water (see the photo) in a number of different areas of the facility. Mass notification systems facilitate the quick communication of emergency announcements to school stakeholder groups, such as parents. Prepare for emergencies by addressing risks, providing tools, and routinely improving mass notification capabilities. Schools should also consider safety preparation from natural hazards. Emergency preparedness, not limited to violence, is discussed on the following page. 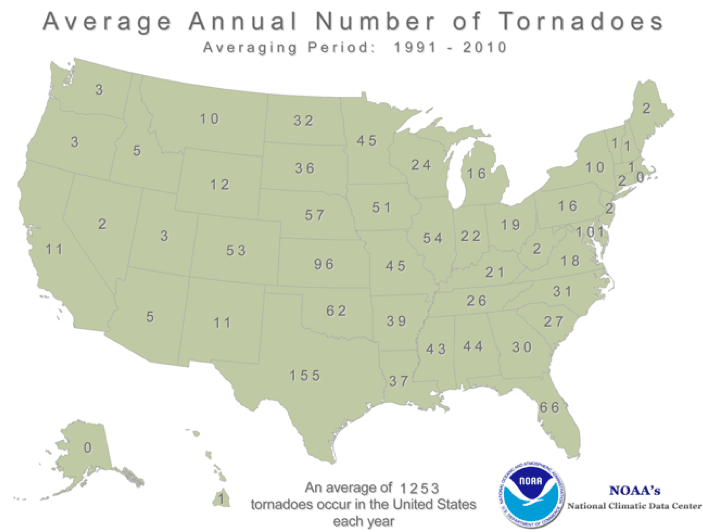 Severe weather incidents are more common than acts of violence. 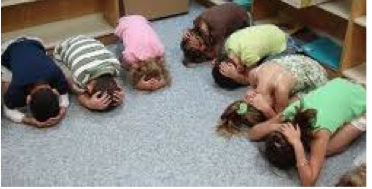 Structural engineers should assist schools in designating tornado shelter areas. Alternative shelter areas may include these options. Exterior Rooms with No Windows or Exterior Doors. Finally, the next section will provide a list of helpful resources for school leaders and community stakeholders to access for more information on safety and security. Make use of these school security resources. This is the US Department of Education's emergency planning resource page for schools. Take advantage of guides, training, and other resources. This is the American Clearinghouse on Educational Facilities (ACEF) resource website. The US Department of Homeland Security funded this video entitled, "RUN. HIDE. FIGHT.® Surviving an Active Shooter Event." These procedures should be considered in a collaborative setting. The Emergency Management Institute developed the Introduction to the Incident Command System (ICS) for Schools (IS-100.SCa) course in collaboration with the U.S. Department of Education. The free course is designed for K-12 personnel. Effective access control assists in the protection of assets, especially students and staff, on school campuses. Access control measures include electronic access control systems, visitor management software, and interior and exterior gates. Effective communication systems ensure school administrators, teachers, and staff members have access to reliable communication devices at any location in or on school grounds. CPTED principles identified in this lesson include natural surveillance, maintenance, designed access control, and border definition. Many of these principles can be implemented at little to no cost. When emergency plans are established, procedures should be trained and tested. School faculty, staff, students, and community members should be informed about a school's security plan. Paul Timm, PSP (Physical Security Professional) assists schools with physical security assessments, emergency planning, training and expert witness services. Trained in methodology from the National Organization for Victim Assistance (NOVA), he is an experienced crisis responder in Illinois. 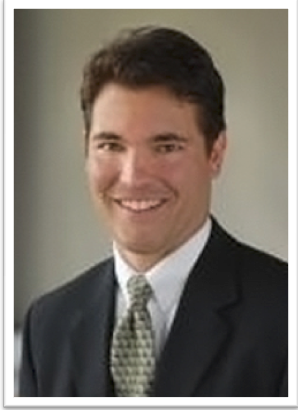 Paul has served on the Illinois Terrorism Task Force (ITTF).